Oroville Dam Leak? With All Internal Dam Water Sensors Broken? No Breach Warning? An earthquake induced leak or if an internal erosion defect develops, deep within the earthen fill zones at Oroville dam, DWR would have no warning, nor the ability to do an immediate slope stability assessment, as the numerous dam's internal Piezometers are non-functional or dead. FERC has been asking DWR to fix this issue for years, as it's a major Dam Safety Issue. Why hasn't DWR responded? Why does the tallest earthen dam in the U.S.A. have zero Piezometers to detect any threat to a potential internal instability to warn citizens of a pending breach? A recent aerial photo of the Oroville dam. LOS ANGELES, CA (California Network) - Santa Clara Valley Water District assures its citizens regarding the Water District's Dam Seismic Stability FAQ noting that the California Division of Safety of Dams (DSOD), along with the Federal Energy Regulatory Commission (FERC) in that they perform dam safety inspections, including the critical monitoring of the stability of the dam's structure. One of the most important instrument in monitoring the health of a dam is a water sensor instrument called a Piezometer. Quoting from the SCVWD FAQ - "How does the water district monitor its dams to ensure they are safe? ", "The water district monitors its dams visually and with instruments installed in the dams. In 2005, the water district created a formal dam safety program, which includes dam surveillance and monitoring. The water district uses a number of instruments to monitor its dams. Internal piezometers measure the dam's internal core for water pressure, much like a person monitors their blood pressure. Pore pressures determine how the water is flowing through the dam. This is supplemented with seepage monitoring downstream of the dams. Inclinometers measure deformation, or a change of shape within the dam. The water district also uses survey monuments to check on the movement of dams on the surface. In addition, water district staff, the California Division of Safety of Dams and Federal Energy Regulatory Commission conduct annual inspections of the dams." . This quote from the FAQ reveals how important Piezometers are in the detection of any water pressure changes in the dam's internal core, "much like a person monitors their blood pressure". It is a critical instrument that is at the heart of determining the internal health of a dam, especially an earthen dam. The Water District's FAQ include details how regular dam safety inspections are performed by DSOD, FERC, and independent consultants in monitoring these Piezometer instrument data readings. The FAQ also describes the importance for such instruments to perform a slope stability assessment of the dam after an earthquake. Another Dam Safety Program, in an Irvine public information website notes "Irvine Ranch Water District Dams Are Safe". 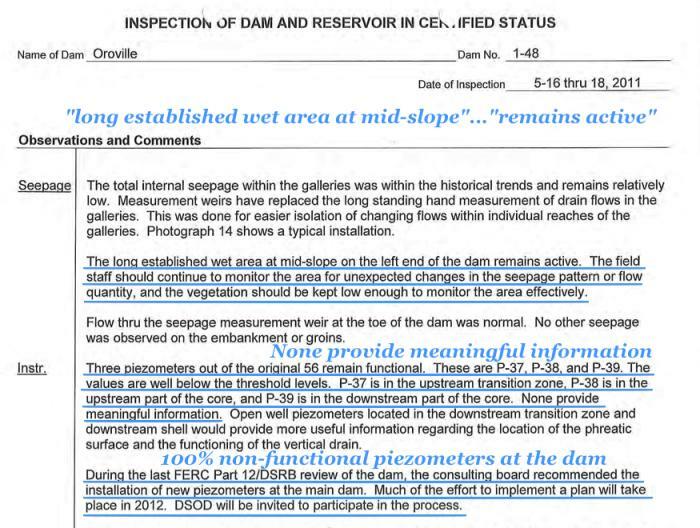 They again note that DSOD performs important dam safety inspections. Quoting from the site: "The Division inspects each dam at least once per year to ensure the dam is safe, performing as intended, and is not developing problems. DSOD also reviews the stability of dams and their major appurtenances in light of improved design approaches and requirements, as well as new findings regarding earthquake hazards and hydrologic estimates in California.". "Piezometers are used to measure ground water and other fluid pressure levels" . So if Piezometers are crucial to assessing the safety and internal health of dams, why does Oroville dam have zero working Piezometers? The dam was originally constructed with 56 Piezometers installed within the dam and dam base rock (See Fig 1). Yet in a 2011 DSOD Inspection report, there is a photograph showing a large group of Piezometer tube bundles that are sliced away and is now a nuisance in that these sliced tubings drip and require a collection pan  (See Fig 3). Does DWR consider Dam Safety Instrumentation of Piezometers a nuisance? 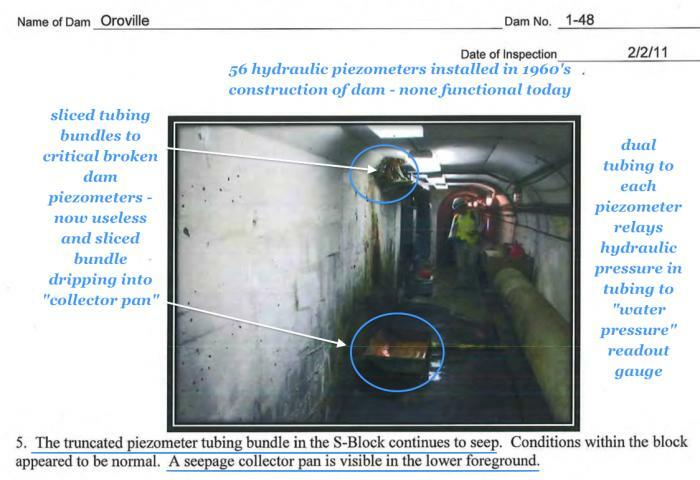 Why does Santa Clara and Irvine reassure the public - of ensuring their dams are safe - as DSOD performs inspections to where Piezometers are stated as part of these important dam safety inspections? All U.S., Canada, and International Dam Safety Agencies note the importance of Piezometers for monitoring Dam Safety, slope stability, changes in potential leakage sources, and their importance in earthquake aftermath stability monitoring . BC hydro in Canada touts that they have 3,000 Piezometers to measure water levels in all of their regional monitoring of slopes, dams, and foundations . So what does FERC think about this situation at Oroville? In fact, FERC has been asking DWR to install Piezometers in Oroville dam for many years. DSOD Inspection reports have been noting this same FERC Part 12 recommendation in their inspection reports from 2011 to the latest in DSOD Inspection report in 2016. Yet nothing has changed. This repeated FERC Part 12 recommendation issue continues as "...a plan for long-term monitoring of the phreatic surface within the dam embankment needs to be developed and implemented.". Why? With the issue of the Green Wet Area Leakage on the backside face of the dam , how is DWR able to determine whether or not there is a potentially threatening deeper seepage path along the base of the dam? They have zero visibility into observing any water pore pressure within the entire dam, other than a "seepage" drain weir at the toe of the dam. What would happen in an earthquake? Any internal stress shear which may occur within the dam core could lead to a silent internal saturation of a section of the dam. With zero Piezometers within the dam, there would be no ability to detect such a condition nor would there be the ability to state if the dam was safe. A silent saturation could develop into an immediate breach or "slope instability" induced slump danger. There would be little to no warning to alert the public. The only recent action by DWR was to install a test drill well in 2016 near the Green Wet Area  to try to figure out the leakage in the side of the dam. With zero Piezometers inside the dam, there is a form of a "blind" analysis to this "Green Wet Area" that is inhibited by the ability to measure the phreatic surface (water levels) within the dam. Indeed, in 2011 a DSOD Inspector had revealing comments. The report noted "Lush grass and weeds covered this area", "The ground remains wet..", "monitoring of the area should continue. Any unexpected changes should be investigated and reported to DSOD". (See Fig 2). This is the very first valid "alarm", albeit low key, of an implied risk from an "unexpected change" of the Wet Area as this is a concern that could develop into a more serious condition. The DSOD report detailed the the conditions as "damp to wet" and "The cause has yet to be determined.". How can DWR state that "the dam is sound" when they do not have the ability to measure what is considered a critical current performance of the phreatic surface within the dam? On top of this, there is an expressed notation to look for any "unexpected change" in a leaking wet area on the dam. Isn't this is what Piezometers are for? DSOD's 2011 Inspection report reveals that they have been speculating that the Green Wet Area may be caused by (1) a possible mechanism causing "perched rain water" to gather in this localized area, (2) a possible "abutment seepage source" (aka "a natural spring"). The report revealed that engineers had looked at early construction reports that noted there was some seepage observed on the rock hillside before the dam was constructed. Yet the Inspector noted "Another possible source could be an abutment seepage..". DWR doesn't know what is causing this leaking wet area. Perhaps DWR should inform the public that they do not have the ability to assess the full safety of Oroville dam as they have zero Piezometers working. They should also convey the significance of this issue in that if an earthquake of a particular strength were to occur, DWR would likely be limited in the ability to warn the public regarding an internal undetectable slope instability due to the lack of any functional Piezometers. Fig 1. May 2011 DSOD Inspection Report - REVEALS Zero working Piezometers inside of Oroville's main dam - out of 56 total, 54 dead and the 3 remaining do not provide meaningful information. FERC recommends new Piezometers. Fig 2. 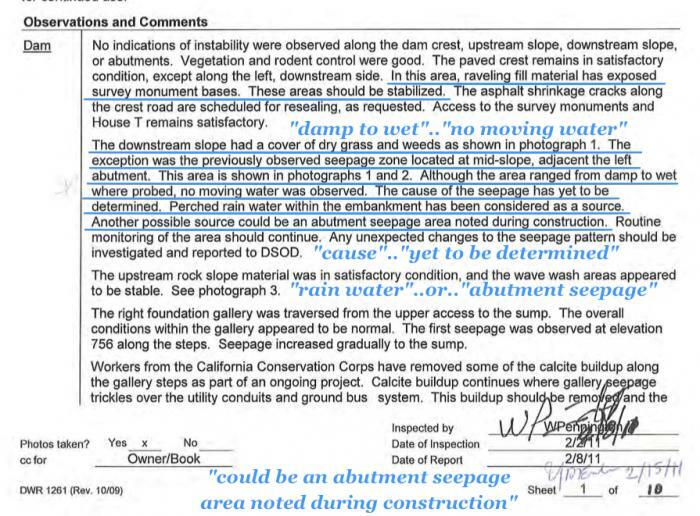 Feb 2011 DSOD Inspection Report - Engineers seeking to understand the cause of the Green Area Leakage - Suggest a source of percolating & surfacing "rain water" or "a possible abutment seepage source (spring)"
Fig 3. Feb 2011 DSOD Inspection report: Sliced tubing bundles to original dam installed piezometer sensors. Tubing bundle dripping into a "collector pan". Piezometers are critical for monitoring the health of the dam for detecting water penetration anomalies which may affect the stability safety of the dam.